It was five years ago in September 2013 that the International Olympic Committee (IOC) selected Tokyo as the host city for the 2020 Summer Olympics. The Tokyo Olympics, set to open on 24 July, will provide companies from the host nation with unique opportunities to market their products, services and initiatives on the world stage. When Tokyo last hosted the Olympics it was 1964 and ¥1.07trn was invested. Fifty-six years on, we expect the economic impact of the 2020 Tokyo Olympics to be ¥1.8trn, with an estimated ¥705bn for infrastructure and ¥645bn for services, and an additional ¥490bn in tourism expenditure. By sector, building construction and advertising services top the list of direct beneficiaries of the Olympics in terms of infrastructure and services, and we also see knock-on benefits for industries such as steel products, electronics, retail and broadcasting. In terms of tourism-related industries, we see larger induced production value in hotels, eating & drinking services, and amusement & recreational services. 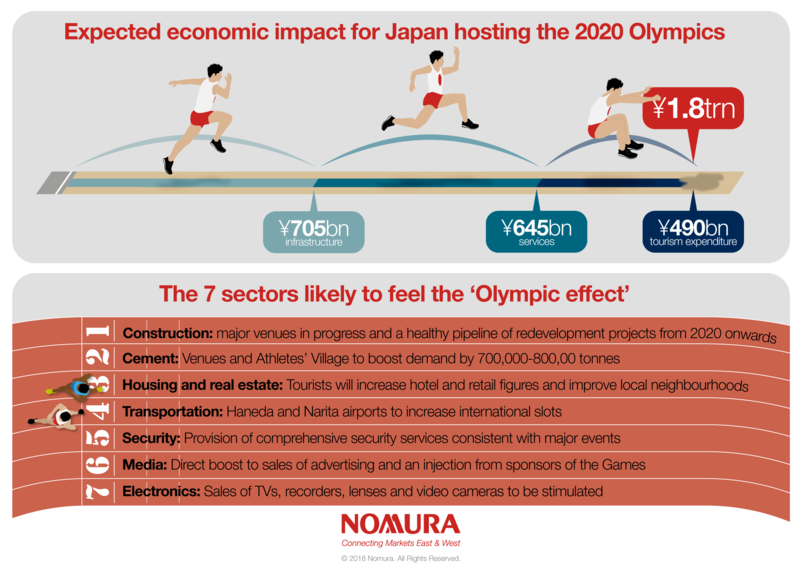 Which sectors in Japan are likely to feel the effect of the Olympics? Construction: General contractors have already won orders for the majority of facilities, and construction work has entered into full swing. There is also a healthy pipeline of major redevelopment projects from 2020 onwards. Housing & real estate impact: we expect a growth in the number of inbound visitors will boost demand for hotels and some retail facilities. The sector could also potentially benefit from infrastructure improvements that boost the amenity and value of neighborhoods. What are the key drivers of this expenditure? (3) impact on sentiment at commissioning parties. Using projections from the Tokyo Organizing Committee of the Olympic and Paralympic Games (TOCOPG) for ticket sales and a number of assumptions, we estimate that at least 5 million spectators will watch the Games and that roughly 20% of these will visit Japan from overseas. These spectators are estimated to contribute demand of around ¥140bn from overseas tourists and around ¥120bn from Japanese tourists, based on data on per capita travel expenditure from the Japan Tourism Agency. We also assume roughly ¥230bn in sales of Olympics-related merchandise. Visitors arriving via the major airports of Haneda and Narita will benefit from an increase of arrival and departure slots, slated to increase by around 80,000 by 2020 (roughly 40,000 apiece at Haneda and Narita), raising the current capacity of around 750,000 by 11%. Both airports plan to boost capacity through more advanced air traffic control systems, rather than by investing a large amount of money on new runways or other facilities. Ensuring the smooth and safe operation of the Olympics highlights the need for state-of-the-art security services. We expect the Olympics to generate increased demand for electronic and stationed security. We also think the Olympics will bolster uptake of these services both for corporations and private households. Business opportunities for security services are likely to appear mainly for electronic and stationed services before, during, and after the Tokyo Olympics. There is an evident awareness that steps need to be taken to prepare Japan for the changes that await it once the 2020 Tokyo Olympics have come and gone. The growth strategy packages that the government has been pursuing since 2013, when Tokyo was selected as the host city of the 2020 Olympics, exhibit a recurring emphasis on the year 2020. Read the full report, Tokyo 2020, Olympics and Japanese equities for full details on the seven sectors and ‘Golden Six’ core stocks related to 2020 Tokyo Olympics.